Brittany completed clinical affiliations in outpatient orthopedics, long term acute care, and sports medicine at Princeton University. During school she also spent 4 years as an intern with Northeastern University men’s hockey. She has a particular interest in sports injuries as well as thoracic outlet syndrome and concussion management. She is a Certified Strength and Conditioning Specialist. 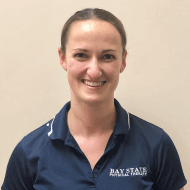 Brittany enjoys reading the most recent journal articles and research and seeking out courses in order to treat her patients with the most effective and up to date treatment methods possible. Being from Cape Cod, Brittany loves everything involving the beach. She also enjoys traveling with her husband and spending time in his home state of Alaska.